The role of Fairy Tales and Mythology in the work that I make cannot be understated; it has become part of my reason to make art. 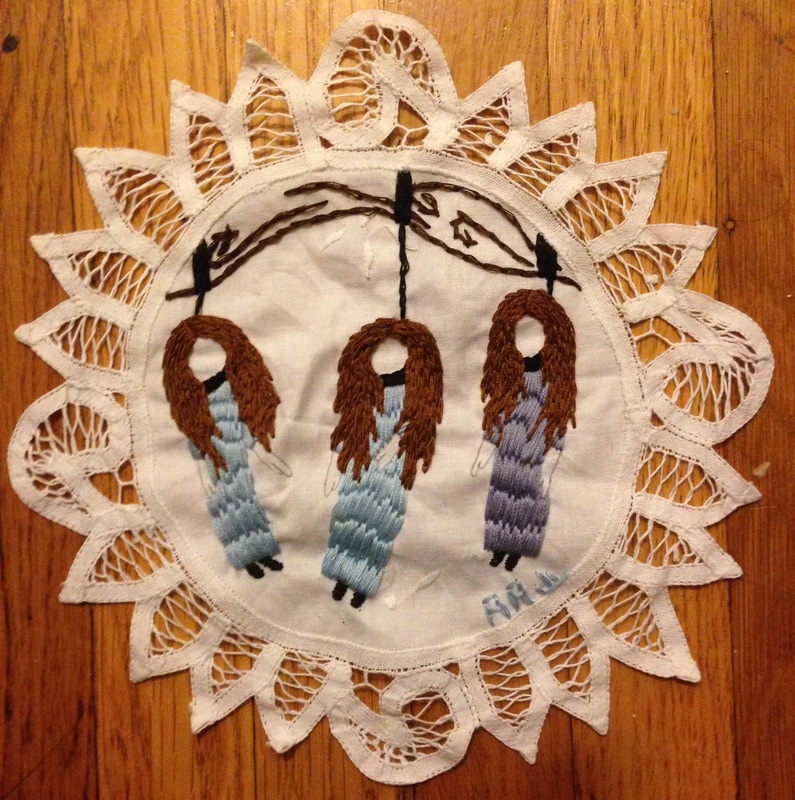 When I first became interested in Embroidering I was making pretty typical non-representational fiber art pieces, but then I read the book The Subversive Stitch by Rozsika Parker and it changed my life. 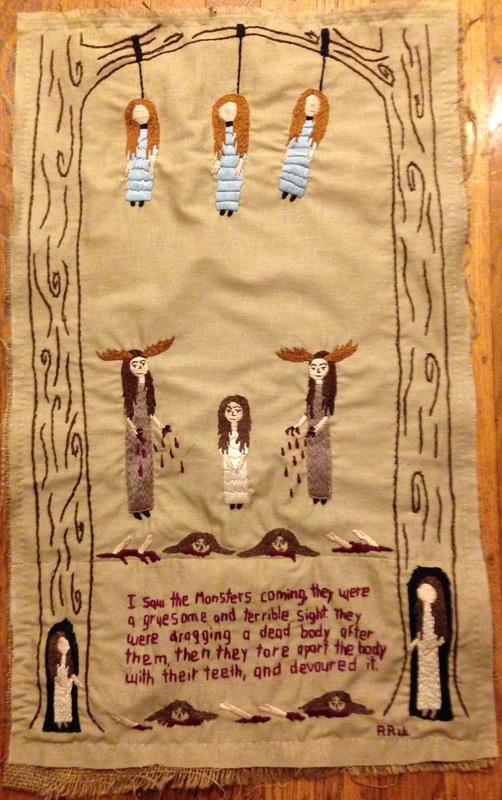 I wanted to do some embroidery but was at a total loss for what I should do, embroidery is more pictorially based – this is not true across the board but is often the case. So I thought long and hard about it and came to the conclusion that I needed to focus on Mythology, Religion and Folklore. It was a natural choice seeing that I had been obsessed with Mythology since I was about five and learned about Greek Mythology. I had written out study cards with each god, their attributes, and the stories which they most commonly associated with. I had learned this behavior from watching my mother, who was at that time going to college for a degree in History. Mine were clumsy and misspelled, but in hindsight seems like pretty extreme behavior for a little kid. I also became obsessed with Lord of the Rings, and through that Norse Mythology, at a really early age and have since read the series probably about fifteen times. So the decision to focus on the subjects that I did was a pretty easy choice; it also didn’t hurt that I was reading a book about Hindu Goddesses. Thus Chinnamasta was born; she is one of the only embroideries that I refuse to sell. The style of the work has changed, as has the skill level, but she is still the grandmother of them all, and I hope to get a tattoo of her one day. As time has gone on I have gotten further and further away from dealing with Mythology and Religion and its myriad of Gods and Goddesses. 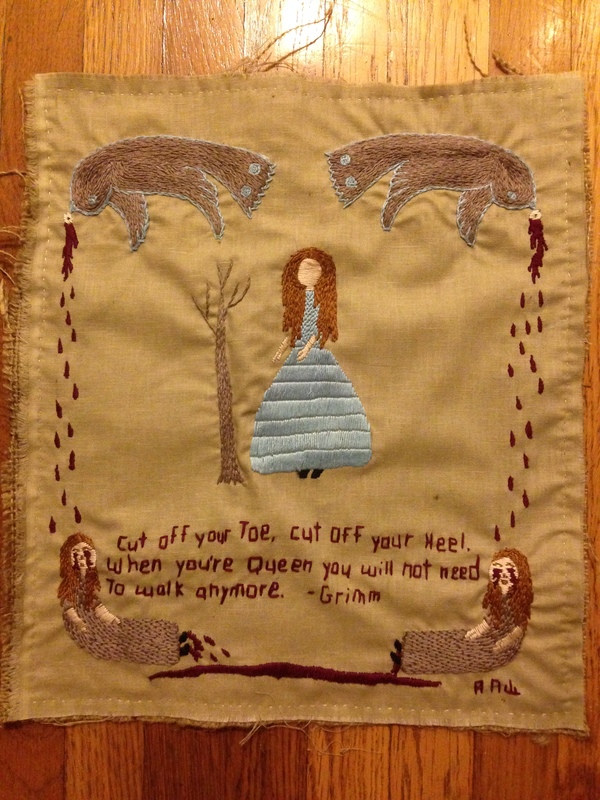 Embroidery as a Folk Art medium seems best suited to the more intimate world of Fairy Tales. I have focused in on that as well, mostly using European tales, being of European ancestry it is easier for me to focus in on these traditions. The Brothers Grimm, Perrault, and W.B. Yeats have been my main influences over the years, each taking their turn in influencing my work. I have gotten away from the idea of illustrating the stories, my work does not have to be a pure illustration of what is happening in the story, but can be changed and other elements added in – which is why often times the description says “loosely based” off the story. The surreal nature of Fairy Tales is what is so intriguing, with transformations, hauntings, and at times extreme violence they have had a major impact on me and the work that I create. Our society automatically thinks of Disney when they think of Fairy Tales, the Disney Princesses who get their “Prince Charming” at the end have had an influence on several generations of women now. I am not interested in those stories; I want the older, raw, visceral version of those stories. The original stories about Cinderella, Little Red Riding Hood, and Snow White include such topics as dismemberment, cannibalism, and torture. The Little Mermaid dies at the end of the original Hans Christian Anderson version of the story; and Mermaids have been associated with the deaths of sailors and prostitution since the Middle Ages, but more on all these stories later. I feel that the gentrification of these stories has caused us to lose something as a society. We may have gotten rid of the sexism that these stories had, but in the process created something insipid in the process, something which lacks soul. Plus, like it or not, the sexism is part of the history of humanity, and especially part of Fairy Tales. So I had planned to write up my current statement as an artist, discussing all of the themes that I am currently interested in. But I’ve been meeting so many wonderful artists, or finding new and amazing artists through Pinterest that I wanted to feature them. I’ve come across so many great artists that this will not be an exhaustive list, and I may have to do future posts. So this year give the gift of art to the ones you love, its something they can cherish and you can feel good about supporting the arts. She is a Canadian artist that I happened to find on Pinterest. I love her work especially her series Great Black Fire, and wish I had money to by her Eerie Dearies book. Portland artist Mary Tapogna does wonderful mosaics, which can be bought through her website or at several shops around Portland. I love her work so much that it is almost impossible for me to describe. It’s wistful, sweet, and dark all in the same moment, its reminiscent of folk art and Surrealism. Lovely dark story telling at its best! Hidden faces that add a touch of horror and mystery. Each piece leaves you wanting to know more, and seem to invite you to finish the story in your own mind. I met her while working at the Museum of Contemporary Craft, I hope you enjoy her work as much as I do. I’m a sucker for art that tells a story or invites the viewer to create their own. His surreal landscapes and disfigured characters seem to share similarities with the work of Hieronymus Bosch and Lewis Carrol’s Alice in Wonderland. I met Daniel volunteering at the Museum of Contemporary Craft here in Portland. Not only is he a really nice guy but his work is incredible, its poignant and well crafted.